Somehow this afternoon, while I wasn’t going swimming with the rest of the family (lax topiary issues) I was to hang around in Paisley while they frolicked at the Lagoon. I spent a little while browsing the reading matter – and an abandonned Daily Record and some tourist leaflets for the whole of the west of Scotland – before moving on to what they have on offer at the Lagoon. Fresh (ish) from a makeover the council pool and gym complex is looking pretty good. It also has a fancy smancy spa called Eve, that offers the full range of over-priced and ineffective, yet somehow still tempting treatments. It did give me pause to consider the issue of the council (my council) running a spa that offers body strategist + cellulite remodeller or the chance to wallow in a rasul mud chamber. Anyhow, that took all of six minutes so I spent the rest of the time strolling into the centre of the town and back. 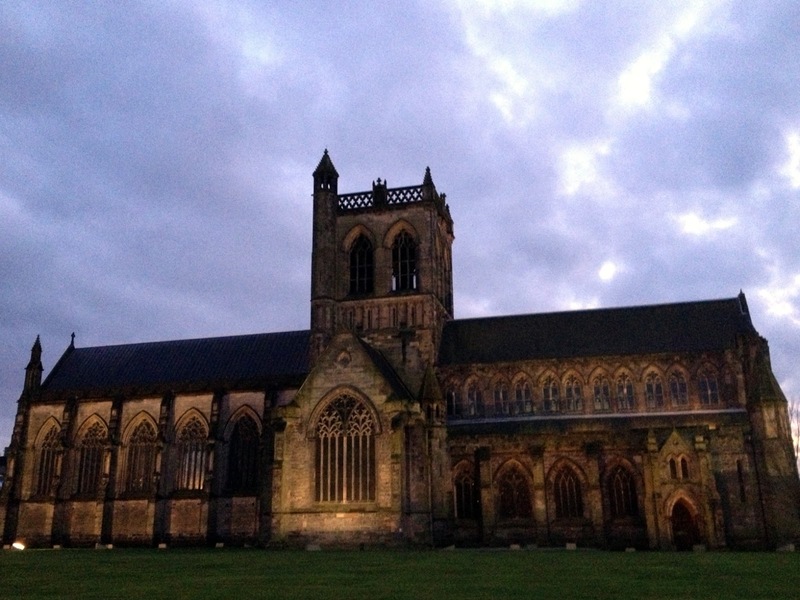 Paisley Abbey loomed menacingly in the gloaming. I took the picture on my camera phone.